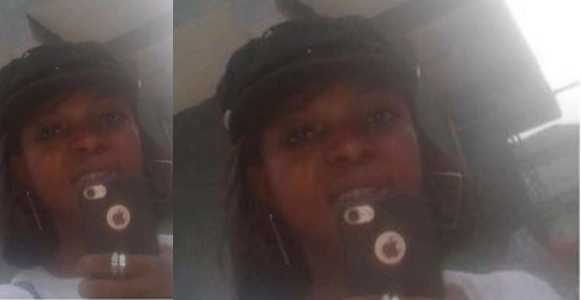 Nigerian lady identified as Anuoluwapo Iyanuoluwa Adeyemi, has been arrested for not returning a stolen iPhone despite receiving a N50k reward from the victim. You will all discover I was offline since Thursday, Well my phone was stolen. Can you believe it? This lady stole my phone. She is the one seen holding my iPhone in the picture below. She in fact, requested for a ransom of #100,000 for me to get my phone. 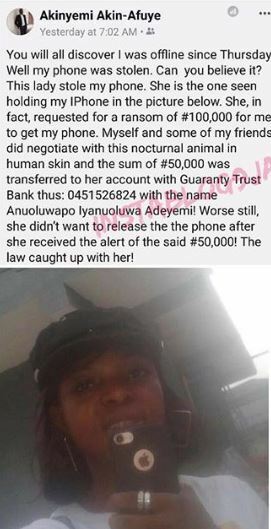 Myself and some of my friends did negotiate with this nocturnal animal in human and the sum of #50,000 was transferred to her account with Guaranty Trust Bank thus: 0451526824 with the name Anuoluwapo Iyanuoluwa Adeyemi! Worse still, she didn’t want to release the phone after she received the alert of the said #50,000! The law caught up with her. » Dysonn score A1 __According to kelvin mtuflow:-my Top ten favorite Benue songs of recent!! » [TALK NAIJA]who is the present king of DELTA STATE base on entertainment? ERRIGA, VICTOR, OR YUNG6IX? Dysonn score A1 __According to kelvin mtuflow:-my Top ten favorite Benue songs of recent!! © 2018-2019 9jashows. All Rights Reserved. 9jashows is not responsible for the content of external sites.